These 5 ingredient healthy peanut butter balls are an easy after-school snack idea and are simple enough for kids to make on their own. They are perfect for adults too! Cooking with preschoolers and toddlers can be a lot of fun for both kids and adults! Cooking with kids has so many benefits including encouraging children to try new foods, learning how food is made, spending quality time together, and building a strong foundation for healthy eating in the future. My kids are now in elementary and middle school, but the time we spent in the kitchen when they were younger helped spark their interest in continuing to help in the kitchen today. When I get my 9-year-old helping in the kitchen, she is still much more likely to try (and eat!) the healthy foods we make. I recently got to spend the day with my 4-year-old niece. She was very excited to get to “cook”, but I secretly think I was more excited than she was! Cooking with a child is a special occasion in my book, and I miss these days of watching the awe and excitement in a young child’s eyes as they get to do these cooking tasks on their own. While my niece Lucy was over, we made 4 different recipes. FOUR! And she didn’t get tired of cooking the whole time. Check out her video and see how fun this recipe would be for your kids to make! These peanut butter balls are after-school snacks at my house quite often. They are super easy and are really, really good! 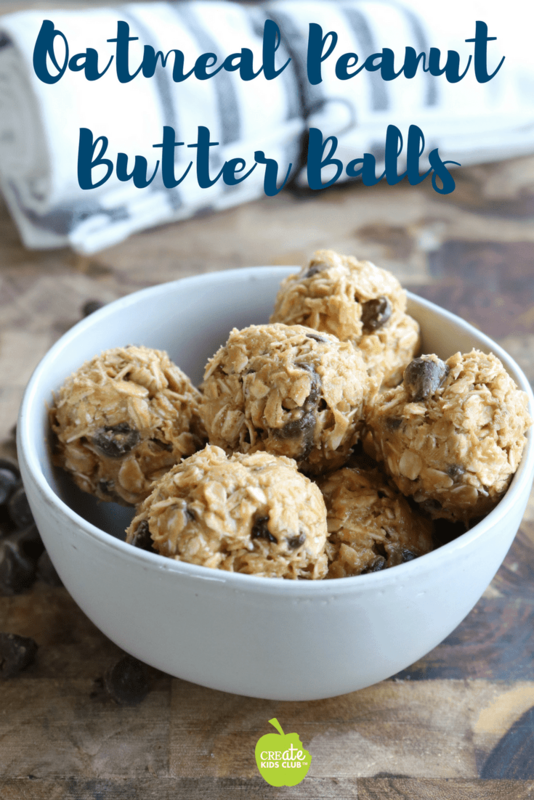 Oatmeal peanut butter balls are a fun healthy snack for kids. A simple recipe that kids can make on their own. Have you made peanut butter balls before? This is a great recipe thank you for sharing it. I was inspired to try to make these treats without the 1/2 cup of honey as a sweetener. I substituted 1/4 cup shredded coconut, 2Tbs Maple syrup and 1Tbs coconut oil. 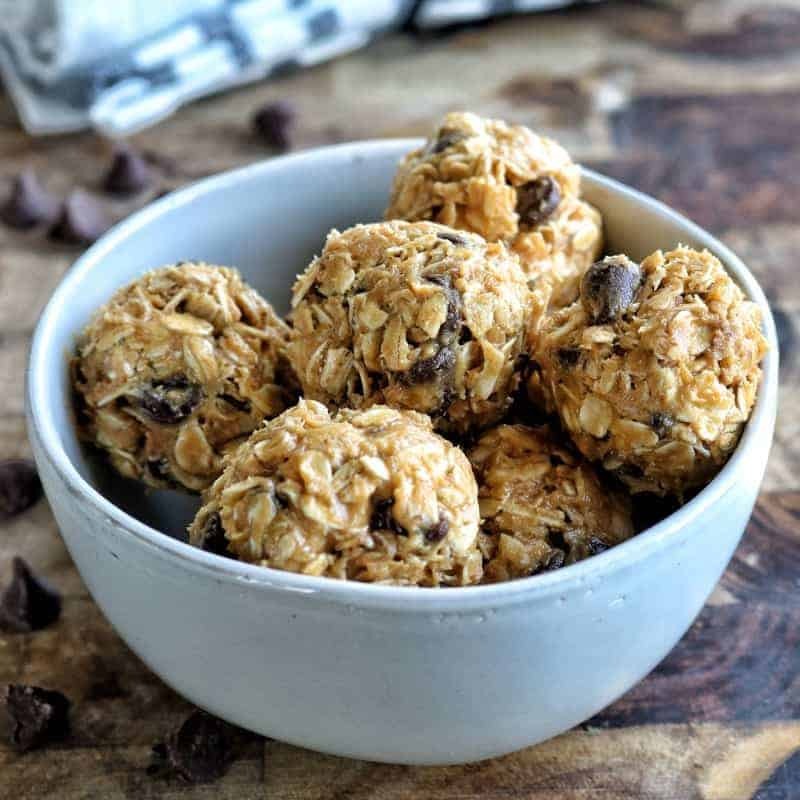 These added coconut flavor,a little bit of sweetness and helped it all stick together in the balls without using the 1/2 cup honey. I love your substitutions, Leslie! I am going to have to give that a try! My kids don’t care for coconut, but I’m thinking with all the other flavors they may not even notice… Thanks for sharing! My kids love this simple recipe! Perfect to whip up for quick snacks! Great recipe for a go to snack. Gave it 4 stars because the mixture sticks to your hands as you roll the balls. Spraying them with a cooking spray helps . Added coconut for just a different twist ! Thanks Donna! I agree, that while these are a favorite at my house, they do stick to your hands while rolling them out – my first ones are always prettier than the end ones! Did the coconut help cut back on the stickiness? I’d love to hear! Thanks for the review, I appreciate it!